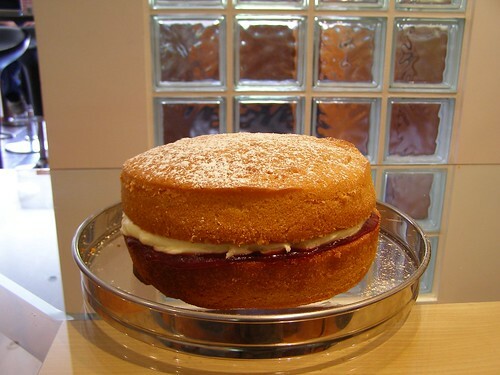 The most popular recipe on the blog so far is this traditional and evergreen classic for Victoria Sponge. The traditional British Victoria Sponge was named after Queen Victoria of England (1819 – 1901). One of Queen Victoria’s ladies-in-waiting Anna, the Duchess of Bedford, is said to have been the creator of ‘teatime’. Because lunch was traditionally served at midday, the Duchess often became peckish about four o'clock in the afternoon. The Duchess spent most summers at Belvoir Castle in Leicestershire. It became common practice for friends to join the Duchess for an additional afternoon meal in her rooms at Belvoir Castle. The menu consisted of small cakes, bread and butter sandwiches, assorted sweets, and, of course, tea. This summer practice proved so popular, the Duchess continued it when she returned to London, sending cards to her friends asking them to join her for “tea” The practice of inviting friends to come for tea in the afternoon was quickly picked up by other social hostesses. Queen Victoria adopted the new craze for tea parties. By 1855, the Queen and her ladies were in formal dress for the afternoon teas. Rather than having lots of small individual cakes this simple large cake became on the Queen's favourites. After her husband, Prince Albert, died in 1861, Queen Victoria spent time in retreat at her residence Osborn House on the Isle of Wight. According to historians, it was here that the cake was named after her. 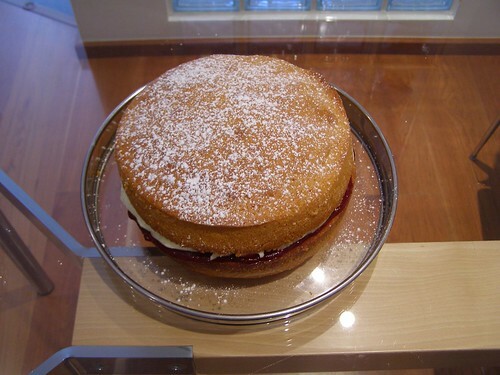 Today the Victoria Sponge is seen to be a simple basic cake to make. Traditional English fetes and Women’s Institutes often have a ‘bake-off’ for the best Victoria Sponge. I believe that a good Victoria Sponge is one of the best cakes but all too often they are not made well and is just a flat heavy sponge rather than the light and fluffy sponge that it should be, sandwiched together with strawberry or raspberry jam and buttercream. I have tried a number of recipes and have come up with the one I think works the best. It is a simple all-in-one recipe that uses a higher quantity of ingredients than most other recipes. With the right amount of baking powder you end up with a well-risen light sponge that looks great. - Divide the mixture between the two sandwich tins and bake at 170 degrees centigrade (340 degrees Fahrenheit) for 30-40 minutes. The cake should be springy to the touch. - When cooked immediately turn out onto a wire rack. 4) When turning out the cakes onto the wire rack, try turning one out onto a solid surface (like a chopping board) and then put it on the wire rack so that the top of the cake does not get the marks from the wire rack. This will make it look much better. THANKS. We just made a cake following your recipe and it was lovely. I helped my 10 year old brother. We loved it. Have wanted to try baking a sponge cake for ages having not baked since school days over twenty years ago. They always taught us to do the mixing in staging, eg cream sugar and butter witha wooden spoon, graudally mix in eggs then carefully fold in flour. I just made icing following your recipe and it's delicious..thanks !! Could you let me know if it is best to use meduim eggs or large? Also is it 160 degrees OK in a fan assisted oven? It seemed to work well for 30 mins at 160 degrees. Gosh, you're incredible! I feel so ashamed of myself, seeing what wonders you can bake! Thank you very much for your wonderful ideas! Hi I used this recipe in a "number one" cake tin for my little boy's first birthday - it turned out beautifully and I got lots of compliments - thanks! Those cakes look yummy will have to try some of your recipes, holl. We have just taken the sponge out of the oven, it looks and smells amazing. Made some little cakes too, some have been consumed already - they are gorgeous, highly recommend this recipe !! Well done mark !! It's my mothers birthday tomorrow and i am definately going to try your recipe! It sounds wonderful, and judging by the other comments left, it sounds great too. I find it incredibly hard to find a nice recipe, as i also agree that a successful cake must be light and moist. Would using fresh strawberries be ok to use, as i find using both buttercream and jam can sometimes be too sweet? wow, just tried the cake and it turned out a treat!! thanks for the recipe, i'll be sure to use it for as long as i make cakes! I haven't baked in ages and saw this and had to have a go. I have just taken my effort out of the oven & I can honestly say I have never made a better cake. Thank you for taking the time out to post your ideas, long may they continue. It is light & moist and tastes delicious. Thank you once again. I made this cake but with cocoa powder instead of the jam for my friend, now everyone at school is begging me to make them cakes! Huge success, they wont leave me alone!! Boy did this cake rise - first time a sponge has done this for me and the taste was good however I did find it a bit greasy and the following day the small piece left was very solid. I'm going to make your recipe again but with less margarine - I can but try. Thanks for your tips. I used to bake , but now have a fan oven and a conventinal electirc oven.i wondered if fan would be better, but I will follow your advise and use the conventional oven. I use 6,6,6 and 3 eggs in mine. (old Kenwood chef recipe). i see someone has mentioned adding cocoa for a chocy cake. Have you tried 1 tablespoon of instant coffee dissolved in dessert spoon of hot water added to the mixute in between adding the flour ( to prevent it curdling)? Makes a great moist coffee sponge. A family favourite. You're a genius - this is a fantastic recipe,so much better than Good Housekeping! Thank you so much for sharing it. going to make it again for grand daughters birthday in a "number 3" shaped cake tin. have meaning to come back and comment on this recipe since July when I actually made it! I've just been reminded about the wonderful cake! So feel the credit is part yours for the fab recipe! Please keep them coming, tried most of your others, all gorgeous too! Thanks for a brilliant reciepe, loved using it. However my butter icing had let me down a little bit, what tips would you give to make it look a lot better? I very rashly promised my sister a cake for her birthday, after not having baked for 5 years. I found your recipe and it worked brilliantly first time round. It fed about 12 people and the whole thing was gone in seconds, and I've been asked for the recipe - THANKS! i always find it hard to bake a cake myself becausei am only 12 and it never works because i always put to much or to less of the ingredients in. but i have decide to folllow this recipe as carefully as i can. my family are looking forward to having a lovely cake for christmas so fingers crossed it will turn out. i will leave another comment after christmas and tell you how i got on!! Is this cake suitable to ice? or would that be too much? I just wanted to say I made this sponge cake today, I was a little worried about it as they sometimes haven't risen very well for me, but this was fantastic! I was making an American-themed cake so I added blue colouring and red colouring to the two separate halves and it still worked fantastically. I didn't find it greasy at all. My only comment might be that the buttercream is very very sweet, I think next time I would use fresh cream and jam instead. Thank you so much for your recipe. I've not made many cakes in my time but thought I'd make one for my boyfriend for Valentines Day. We've tucked into it already and its amazing! This recipe is great! Simple and easy to make. Im addicted! very tasty!Everybody should try it, you wont be disappointed! Thanks. Hi! Thank you so much for posting this recipe! I have tried several other Victoria sponge recipes and they all produced sad looking cakes. Your recipe resulted in a fabulous cake which has now become a family favourite! It looks great and tastes delicious!! Hey, Ive made two cakes using your recipe, worked beautifully but i did add two more eggs as the mix seemed far too thick. My friend stole half the first one, and the seconds for my mum (its mothers day on Sunday). I tried your recipe yesterday and it is by far the best Victoria sponge I have ever made. It looks fab and tastes great. My previous efforts (using other recipes and methods) have not risen and have looked pretty pathetic. Thanks for a marvellous recipe. Just made my wife a birthday cake with this recipe, its absolutely fantastic. I only made one layer and used a vanilla butter cream on top with some flaked chocolate. We shall see tomorrow but it looks awesome. I used the leftover mixture to make cup cakes and topped these with chocolate and vanilla fondant icing, again with flaked chocolate, have eaten two already and they are about the best ever. Hi! Thanks for your recipe. I have used it several times now and everyone keeps wanting me to make more! I am now actually making one for fathers day! Anyway, thank you! Thanks - I used your recipe to make a birthday cake and it turned out brilliantly! Everyone commented on how light and fluffy, and tasty it was. It was the first cake I've really made and was so easy to do. Hello, I want to try your recipes but I am in the US and don't own anything that converts grams into our liquid and solid measures. I've tried doing the flour with math from grams to cups and got some horrible decimal rather than cups and our teaspoons or tablespoons to make up the difference. Do you have American versions of your recipes or a converter you recommend that does weights into volumes? Thanks! This is the only cake recipe I have ever used. It rises really well in the centre but not at all at the sides, anyone know why? Also I have just moved out and only have a conventional oven. I have tried three times to make a cake in it, cooked them for the same amount of time as in the fan oven, they all had risen, looked fine, skewer came out clean but when I sliced the cakes open they were not cooked through...help?! Is there a differnt time if using one large 8inch tin and not 2? Also what size eggs are you using? excellent recipe,i have been looking on the net for a long time for a victoria sponge and this is perfect,it's really soft and light. I have been trying to find a good victoria sponge mixture for a while now and have come across yours. The remarks people have made have been excellent and I will be baking your cake this aftrnoon.I'm hoping it'll be delicious! I have also seen your video which is a lot easier as you can see what you have to do and you have an idea on what your cake should look like! Thank you very much for your easy to follow instructions and I do hope that my cake goes to plan!! I have been looking for a fool proof Victoria sponge for ages now and this is it! Thank you so much, it turns out fantastic every time. About to bake one now. I have made a victoria spoge following your recipe. However my cake did not rise that well. Does anyone have any tips for me? i found this recipe 2day and decided 2 make it. im just waiting for it 2 finish cooking in the oven, cant wait 2 try it later on! Wanted to make my fiance a birthday cake for his 40th. I've tried 2 other recipes but nothing like this one! Only came across this recipe days before I was due to bake the night before the surprise meal. I gave this a try, family and friends gave the thumbs up! Thank you. I made this last night used lurpak spreadable unsalted instead of margarine as I don't like margarine. I used raspberry jam and defrosted frozen raspberries. It came out a dream, it was light and luscious. I was so pleased. Thank you for the recipe my work colleagues loved it. Hey, this is the 2nd time I have made this cake now using your receipt and it really is great, thank you!! Lovely, light and moist it also rises very well!!!! Thank you will use again and again!! Thank you so much for this lovely recipe. I have baked this cake countless times and it never failed. The cake has great height and the buttercream is just gorgeous. I made this product last week and it worked out great. I am so gratful for this website or i would not have been able to make it. so a big thanks to you and all my family enjoyed it. Thanks for sharing this recipe, it's a great all-in-one so much better than the traditional way. I have just made this cake for my boy's birthday party. Everyone LOVED it. I have baked other cakes however this one was very light. Instead of buttercream i used fresh cream and strawberry conserve, it was DEEEELISH! !.I am so surprised that u can just simply throw all ingredients in instead of doing it in parts....THANX!! I have to say that this Victoria Sponge recipe is the best I have ever tried. Rises beautifully and tastes wonderful. Its now out the oven; and its a success (: we'll ice it later. But for now we'll just enjoy looking at its beautiful, light, fluffy apperance. So Tah. I never bake a cake in my life, then I found your recipe! Although it didn't come out as fluffy as it should (looked more like an Italian magarita cake :), everbody LOVES it! So moist and delicious. I will keep practising. Many many thanks! I never bake a cake in my life, then I found your recipe. Although it didn't come out as fluffy as it should (looked more like an Italian magarita cake :), everbody loves it! So moist and delicious. I will keep practising. Many many thanks! OMG this receipe is so fantastic!!! I can never get my sponges to rise properly - they're usually mountain shaped; very high in the middle and like a biscuit around the edges. I plonked this mixture in the tins, levelled off, and 30 mins later had two wonderful, well risen and light sponges. Sandwhiched them with raspberry jam and fresh whipped cream. Yum! Yesderday I made a second sponge but added a teaspoon and a half of almond essence to the mix, then sandwhiched together with almond buttercream. It is soooooo good! Thanks for this sponge receipe, it's amazing! Hi - Iv'e just made a chocolate version of your cake for the second time - just using 200g flour and 85g of cocoa powder. The recipe still works brilliantly and produces a lovely big cake. If you wanted to make a bigger victoria sponge to use as a birthday cake to feed say 15 people, would you just double the receipe do you know? I can't seem to find out what you do and can only find receipes for victoria sponges that serve 8-10 people. I need to bake a cake this saturday for my partners birthday and really need help! Thanks in advance and I hope you can help! Utterly delicious and very light, moist cake! This is simply the best recipe for a victoria sponge that I've ever come across. I just took this cake from the oven, and it smells amazing. Thanks for the recipe! Made this cake for my mother birthday, it was fantastic, thank you for sharing such an easy recipe, now going to make another one today. Awesome cake! Goes down a storm, just need to get some better tins so that they pop out nice and smoothly, my cake looks a bit rough and ready!! All my life I've baked flat heavy sponges that have never risen. I've tried hundreds of recipes that have never worked. Your recipe is fantastic, I've used it a dozen times and every time the cake is perfect, light and really well risen. My children and all their friends say it's the best cake they've ever tasted! Thank you so much! Have just taken this out of the oven, and it looks perfect! Be warned though, this recipe does make one mammoth sized cake! It's going to last me weeks! Thanks so much for this recipe! I'd spent years using the "cream butter and sugar, add eggs then flour alternately" method and always ended up with average cakes that were quite heavy. This recipe is just so easy... and so light! Have made this cake twice now and it's gone down a storm both times! I used it as the basic sponge for a birthday cake and it went down a treat! Now I have more on order! I tried this recipe today and the middle of the cake sunk quite a bit at the end of the baking time. I used butter, but in the recipe you said margarine, do you think that is the reason. Though on the youtube viseo you mention butter. Also had another question, what is the name os the cake mixer you are using. I love the sheild it has to prevent the flour from flying. Thank you again for the wonderful recipes. This is the first time I've baked a cake since I was about 11 and it was amazing! It was for my boyfriend's birthday and I made a marzipan Cartman to go on top-nonetheless I was lucky to get it out of the house as my parents were circling like vultures :D Thank you man and please don't stop blogging your recipes! Must try this one! Is this American or English flour? If American, could I use cake flour instead? Many thanks! Thank you for your wonderful recipes for baking a sponge cake. Unbelievable it was the best sponge cake. So easy to make. Thank you once again. Very good cake, works well. Add any good recipes to www.thestudentchefs.com, there is £50 up for grabs!!!! I think I found a new most favorite blog, I will try this cake next week. Just a quick question, do you think if I replace part of the flour with equal amount cocoa powder I can make a chocolate sponge cake or it will be a big mess? fantastic!! First cake I have made that's edible!! Everyone commented on how good it was. However, I did not use as much icing sugar for the buttercream as I don't like it too sweet. I used 285g instead and it was lovely. I'm so pleased. OMG .. Just tried your cake recipe tonight after 3 failed attempts at making victoria sponge cake, so after that, tonight was if it goes wrong not trying again !!! It was very lovely and spongy and lovely... any tips on how to make the perfect chocolate cake ? Wow, how are you so thin with all those stunning cakes. I only have to look at one and I pile on the pounds. I used this recipe for a Hello Kitty cake and it worked a treated, you definitely get a substantial slice! thanks soooo much, i made this for y mum after watching a cookery program and now shes paying me to do it for all her friends! I have made lots of Victoria Sponges in the past but your recipe is undoubtedly the best..it is a true Victoria Sponge light and fluffy. I have one in the oven now for friends to enjoy tomorrow. Thank you for your recipe and your blog you are truly a very creative and inspiring cake maker.